✔︎ ESSENTIAL OIL DIFFUSER WITH RELAXING THERAPEUTIC EFFECT ► invigorate your mind, body and soul with the utterly soothing aromatherapy experience that the Welledia Gentle essential oil diffuser offers. Through ultra-high vibrations of 2.4 MHZ, an incredibly fine vapor that lingers in the air longer is produced, scenting and humidifying the air around you. ✔︎ CUTTING EDGE FEATURES ► the Welledia Gentle essential oil diffuser electric comes packed with top-notch features you'll absolutely love. A built-in ionizer purifies the air to effectively combat against allergies, while an auto shut-off mechanism turns off the diffuser when the water level is low. Talk about an all-rounded aromatherapy diffuser! ✔︎ COMPACT AND QUIET AROMA DIFFUSER ► at 4 x 4 x 6.5 inches, this is one of the most travel-friendly diffusers for essential oils on the market. Even with the sizeable 150 ml reservoir, it's still small enough to fit in your luggage. And to top it all off, the operation is whisper-quiet. And when you're done heading to nirvana and back, you can easily take it apart for effortless cleaning. ✔︎ CAPTIVATING LED LIGHTS ► Welledia Gentle is more than just an aroma diffuser; it's visually striking as well! You can choose between a stunning rainbow effect, 3 fixed colors or turning the lights off completely. It doubles as the perfect night light, lulling you to sleep with a soothing glow. ✔︎ DEDICATED CUSTOMER SUPPORT/ 100% MONEY BACK GUARANTEE/ 1 YEAR WARRANTY ► we're not fully satisfied until you are. Our dedicated customer support team will gladly aid in replacing parts or honoring the no-questions-asked 100% money back guarantee. There is absolutely nothing to lose. Click the Orange button to Order Now! INVIGORATE YOUR MIND AND BODY WITH THE WELLEDIA GENTLE AROMATHERAPY DIFFUSER & HUMIDIFIER Looking for an essential oil diffuser that takes functionality to a whole other level? 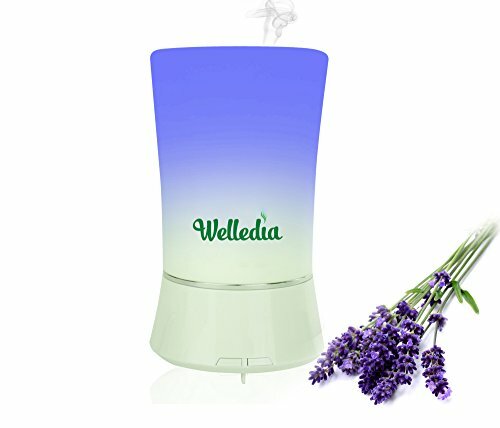 Then the Welledia Gentle Ultrasonic Aromatherapy Essential Oil Diffuser and Humidifier is perfect for you! Brace yourself for incredibly soothing aromatherapy sessions right from the comfort of your home. Welledia Gentle uses cutting-edge ultrasonic vibration technology to quickly diffuse your favorite scents throughout the room. By creating a fine mist output of 1.3 microns without any sort of heating, the integrity of the oils is preserved, offering a truly authentic aromatherapy experience. The 150 ml tank can easily cater to a room of 300 sq. ft., with the diffuser able to operate for up to 3-4 hours. Welledia Gentle does more than just scent the air; it purifies and humidifies it too! Thanks to the built-in air ionizer, foreign particles in the air are dispersed, which can prove invaluable during allergy season. Its humidifying function is perfect for soothing dry coughs and sinus irritations, while adding an enviable glow to your skin. This aromatherapy diffuser will awe you with its breathtaking LED lights that can be customized to your preferences. You can also carry it around on all your travels, courtesy of its compact size of 4 x 4 x 6.5 inches. USE THIS DIFFUSER FOR 100% THERAPEUTIC GRADE ESSENTIAL OIL: Such as: Aura Cacia, Kis Oils, Healing Solutions, Now Foods, Edens Garden, doTERRA, Plant Therapy, Edens Garden, Majestic Pure, Indigo Wild, Plant Guru, Plantlife, Desert Essence, Young Living and many more. Experience unadulterated relaxation with the Welledia Gentle essential oils diffuser. Enjoy 100% money back guarantee by clicking "Add to Cart" now!